Institutions of higher learning invest a great deal of time and money on retention issues. Research has identified institutional variables significant to student retention. Current researchers suggest each institution conduct studies to determine the specific factors important to the population served. Increasing retention has considerable financial and economic benefits to the institution, as well as benefits to the individual, especially if it leads to program completion. 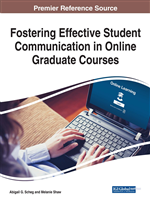 Research of literature has also indicated that quality of faculty and academic advising communications are two important factors perceived by students as contributing to overall the academic experience. Many online institutions are challenged to retain students beyond the first few courses. While the data are complex, most studies show that student attrition rates at online institutions are 3% to 5% higher than those of traditional institutions (U.S. News and World Report, 2015). Student retention is a noteworthy issue for higher education institutions and is closely tied to accountability (Eaton, 2011). Research on student attrition has been well documented over the past few decades (Astin, 1993; Braxton, Hirschy, & McClendon, 2004; Pascarella, 1985; Spady, 1970; Tinto, 1975, 1993), yet the growth of online education and the heightened focus on institutional accountability adds to the complexity of this issue. There is an urgency to understand student attrition risks. Researchers have linked student unhappiness as a factor closely associated with attrition. More research is needed to identify the factors that may affect student persistence such as student satisfaction. This chapter will include an identification and examination of factors related to doctoral learners’ satisfaction with the institutional experience, which may impact program retention in online institutions. Recognizing specific factors that influence retention may provide organizational leaders with insights that can help them develop pragmatic strategies for enhancing the learner’s educational experience and make it easier to retain them through graduation. The role of communication with faculty and academic advisors will be emphasized. Tinto (2005) asserted the more integrative the college experience, the more likely the student will persist until the degree is completed. Institutions should identify factors that may increase retention. Institutions can influence certain retention factors to promote persistence among students by identifying the variables that impact satisfaction. Increasing retention has considerable financial and economic benefits to the institution as well as benefits to the individual, especially if it leads to program completion. Factors that influence retention in a doctoral program, especially in an online program, are not widely reported in the literature. The literature that does exist linking student satisfaction to retention, particularly in the areas of faculty performance and academic advising, is limited. Factors influencing student retention differ among educational institutions. Many studies focus on those factors that make it more likely that students will drop out of programs. However, this study will focus on those factors that encourage students to stay in a program. Research findings suggest several variables that relate to student retention, offering opportunities for institutions to provide programs and resources to satisfy the wants and needs of their students. Kara and DeShields (2004) emphasized the importance of recognizing factors that contribute to student satisfaction in for-profit, consumer-oriented educational institutions of higher learning. Helgesen and Nesset (2007) suggested student loyalty is linked positively to student satisfaction. Loyalty is a critical factor in the long-term success of institutions. Results of research indicate emotional commitment to an organization is crucial to student loyalty. As a result, it is important for the online educational organization to develop a relationship with the student in order to enhance the profitability of the organization. Student loyalty increases when they are satisfied and when the reputation of the institution is both apparent and recognized. Researchers have identified measurable demographic and institutional variables significant to student retention (Herbert, 2006). With the increase of online education, institutions offering these programs will benefit by identifying ways to create a positive experience for the doctoral student. Student satisfaction is a broad concept which may be broken down into smaller variables, such as quality of faculty, program delivery, and institutional commitment. Each variable may have a greater or lesser impact on student retention. It is critical to differentiate among them and to determine their relative importance to the program as strategies are developed.